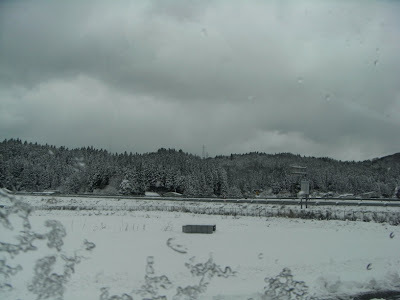 It is now winter and snowing heavily almost every day in Akita prefecture. 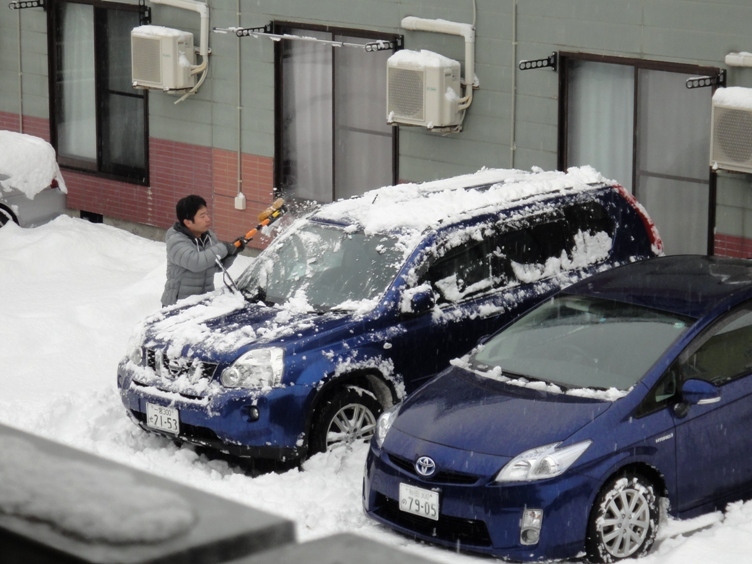 Winters in Akita prefecture are reputed to be among the snowiest and coldest in Japan. 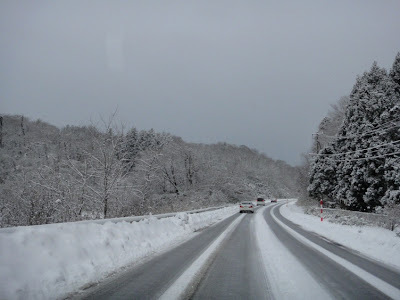 Winter season is rather long and too severe here which starts around November and continues until end of March. There is almost continuous snowing from December through March. The temperature stays at sub-zero levels throughout the months of January and February. 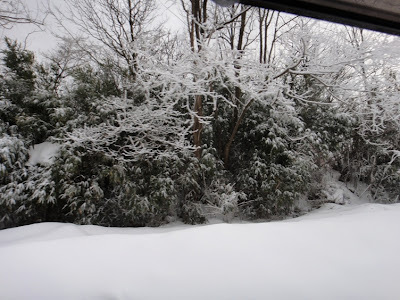 This winter I have gone out with my camera on several occasions and took a few pictures of the snow all around us. This year it started snowing in the beginning of December. 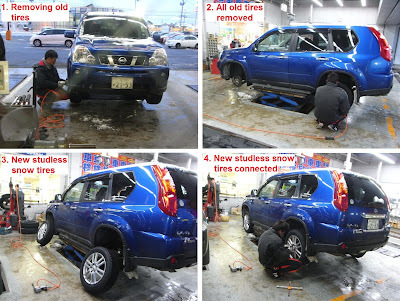 During winter hubby has to change the tires of our car to studless snow tires. 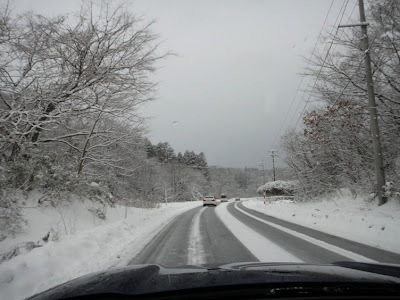 On 9th December 2012, hubby and I drove up to an automotive parts and accessories store in Akita City where he bought new studless snow tires this year. 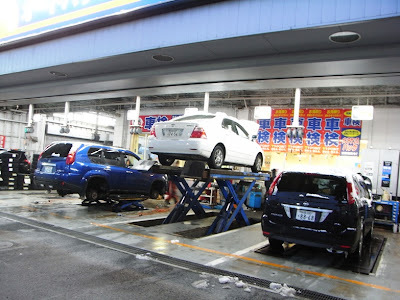 It was fun to watch the store staff remove the old tires of our car and replace them with the new ones. It took only 20 minutes to change the tires. 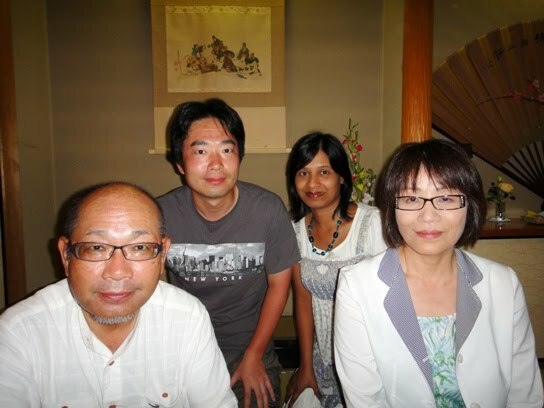 Hubby and I went to see a movie at a theater in Akita City on 22nd December 2012. We went to the theater by our car. 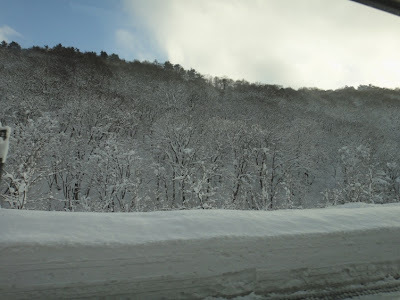 While driving, we saw that a lot of snow had accumulated and all the trees of the forest adjacent to the road were covered in snow and seemed to welcome everyone for a white Christmas. 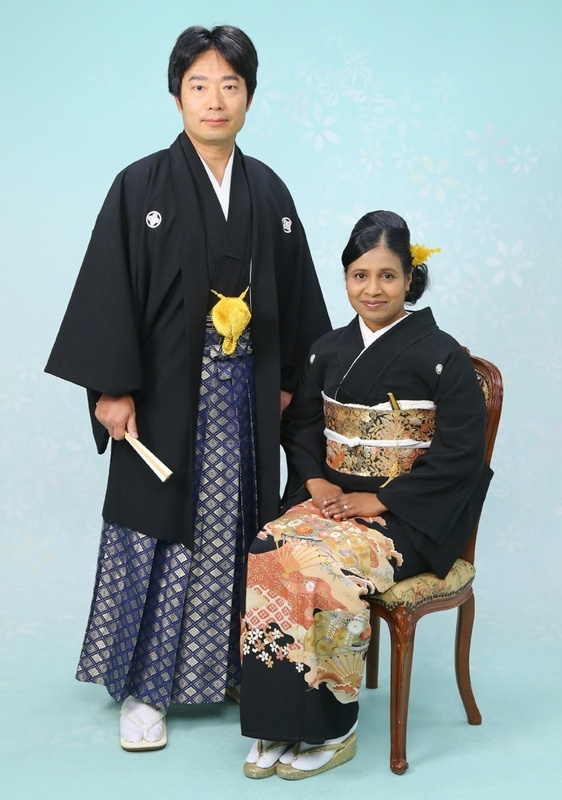 During the New Year holidays, we had been hubby’s ancestral home in Ichinomiya City by our car. 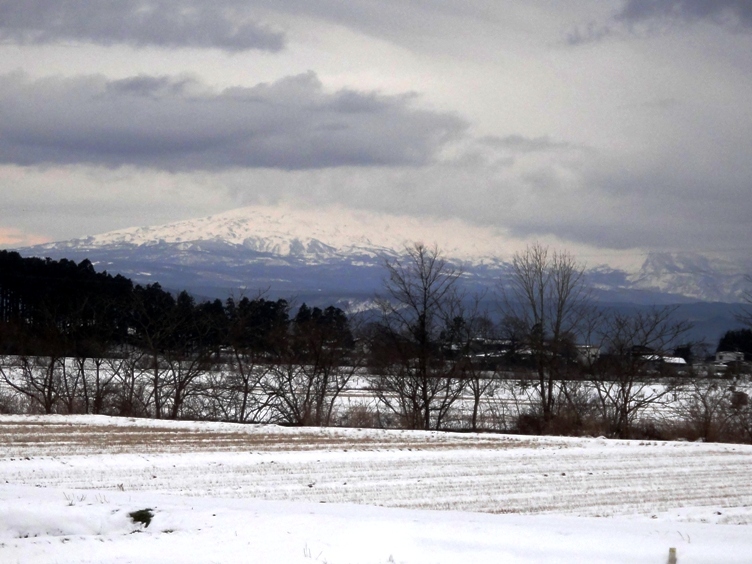 While returning back to Akita on 5th January, we noticed that there was hardly any snow on the eastern (Pacific) side of Japan. But as soon as we entered Akita prefecture, we saw blankets of heavy snow all around us. 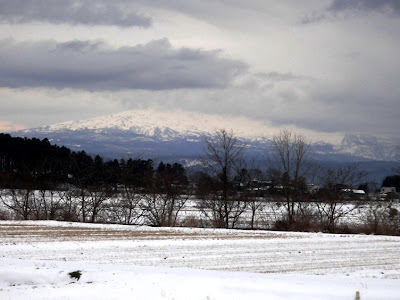 There was deep snow on the mountains and everything seemed to be purified and white in color. 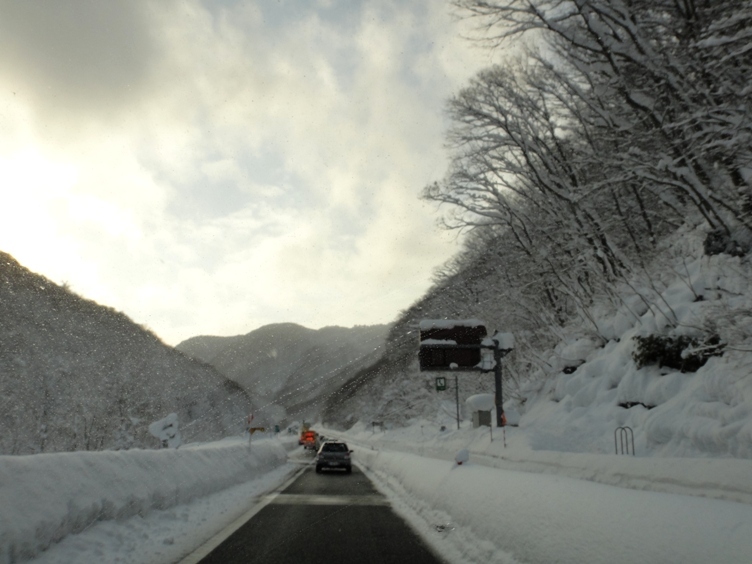 The temperature remained sub zero and it snowed heavily and continuously throughout the month of January. 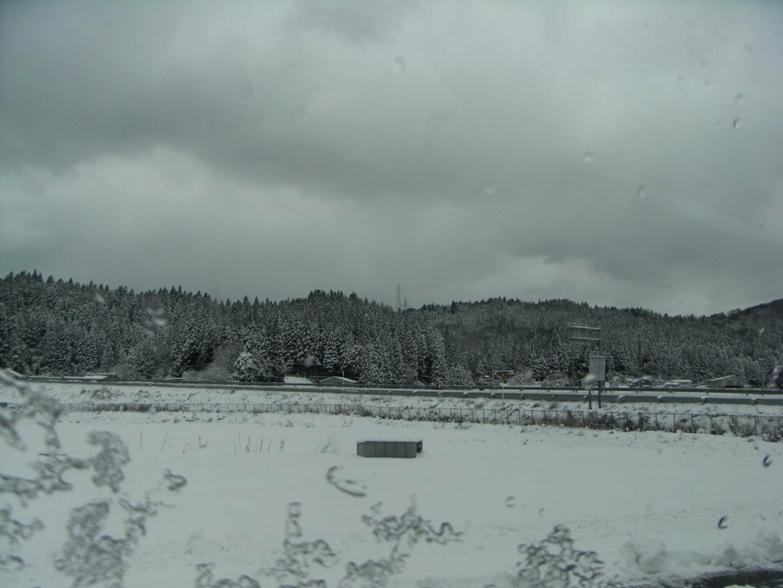 On 26th January, we went to Akita City by our car to do some shopping. It had snowed a lot the previous night and it took hubby almost 20 minutes to remove the huge amount of snow that had accumulated on our car parked at the open parking area near our home. 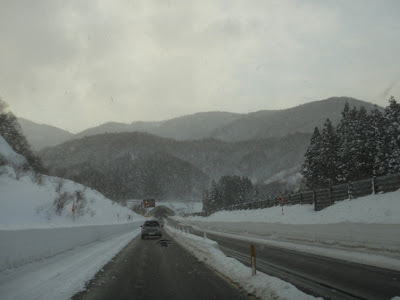 There was snowstorm on 26th January, and therefore it was tremendously windy with continuous heavy snowfall that day. The visibility was also extremely poor and we could hardly see anything around us. The drivers of other vehicles were very careful and driving very cautiously. 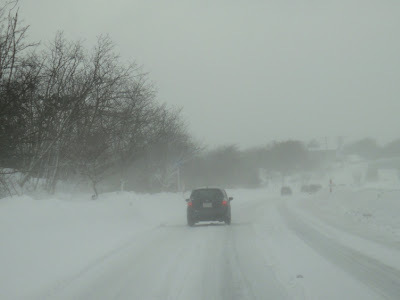 The drive through the snowstorm was somewhat a scary experience for me. 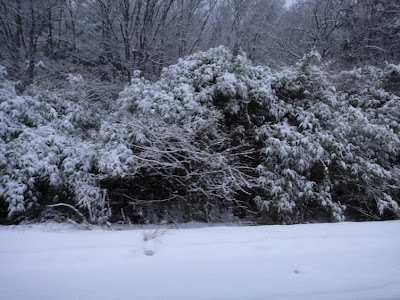 I clicked a few photos and compiled a video of our drive through the snowstorm. 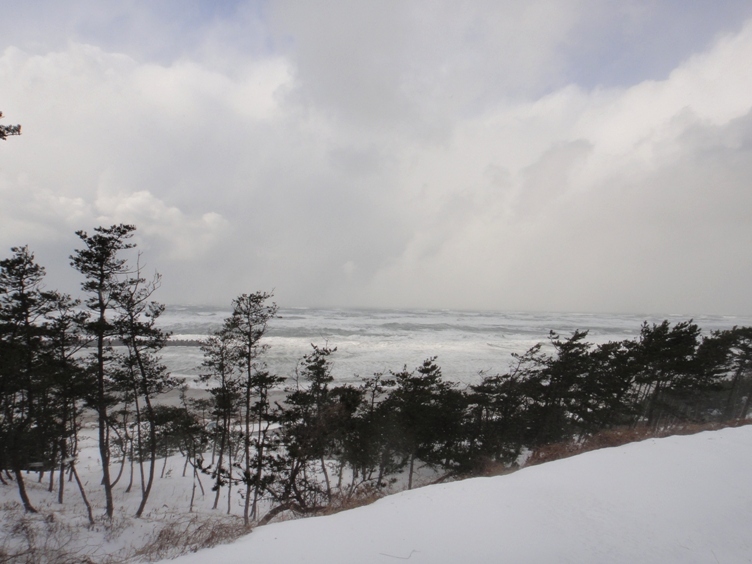 The road to Akita runs along the edge of the Sea of Japan. 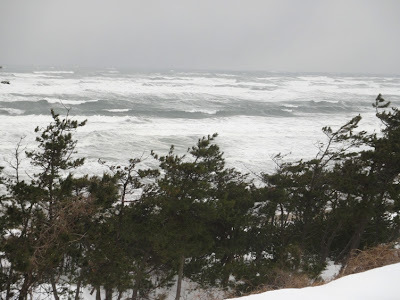 While driving through the snowstorm, we could see the angry sea with big waves. We stopped at a car parking area of a convenience store and just watched the sea for some time. 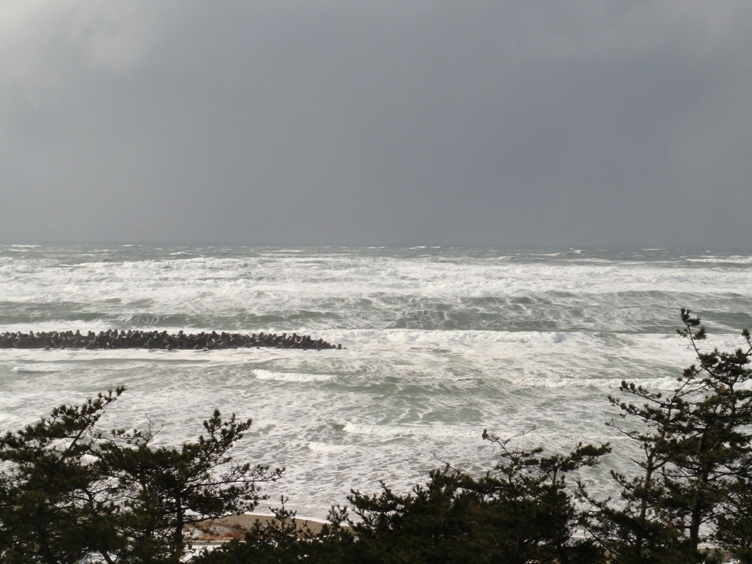 I realized that there is something so mesmerizing about the angry sea. 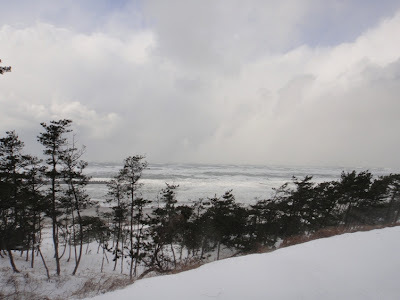 Again, I clicked a few photos and also compiled a video the angry Sea of Japan. Now it is mid February and we are in the middle of cold harsh winter. There is massive amount of snow everywhere around and it is almost impossible to walk outside nowadays. But inside the home, hubby and I often enjoy a warm meal of traditional one-pot winter dish named nabemono. 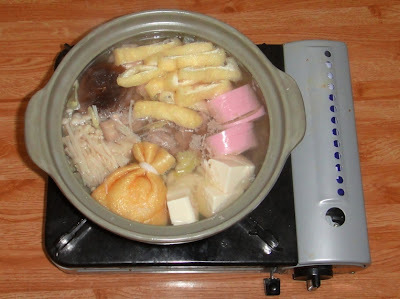 Nabemono warms us from inside, so we do not need to warm up our home for several hours. HI! Good observation. I enjoyed reading your post. Thank you for sharing this. Thanks Mekkan for your nice comment. Hope you liked the photos ofsnow covered Akita. The snow looks so pretty, but dangerous to drive through. Thank you very much for your comment Lisa. 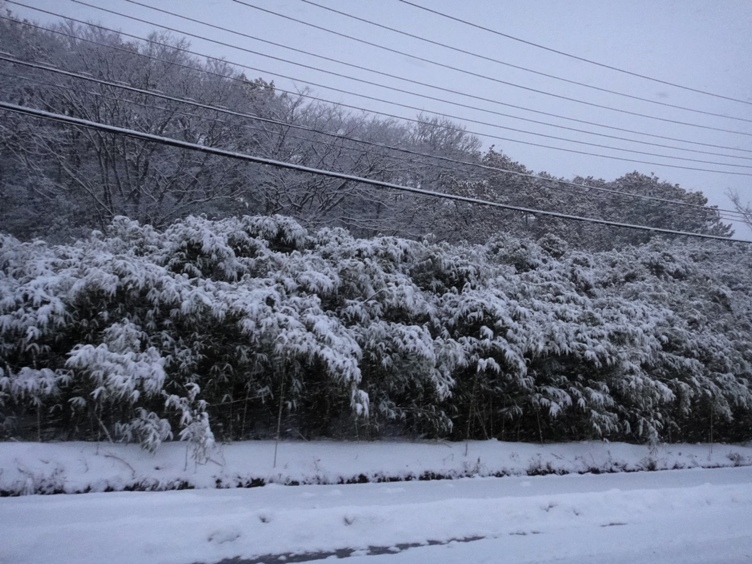 The whiteness of the snow seems so beautiful but it is too cold. 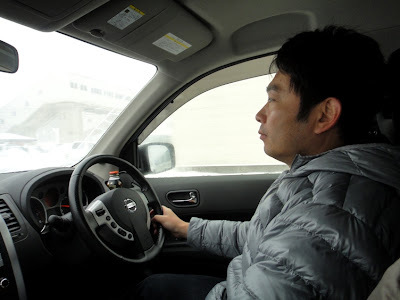 We had gone out to buy weekly grocery that day, but yes I was a bit scared to drive (well, just ride in my case) through a snowstrom. Thanks Anonymous for your comment. 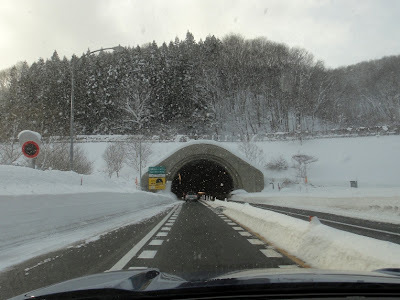 Yes, it will be nice to visit Akita in winter season. 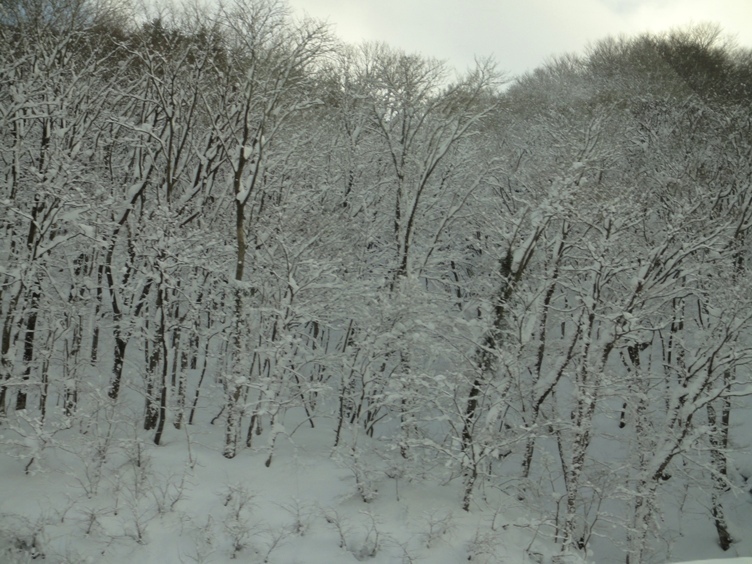 It is really beautiful all around and there are many winter festivals. 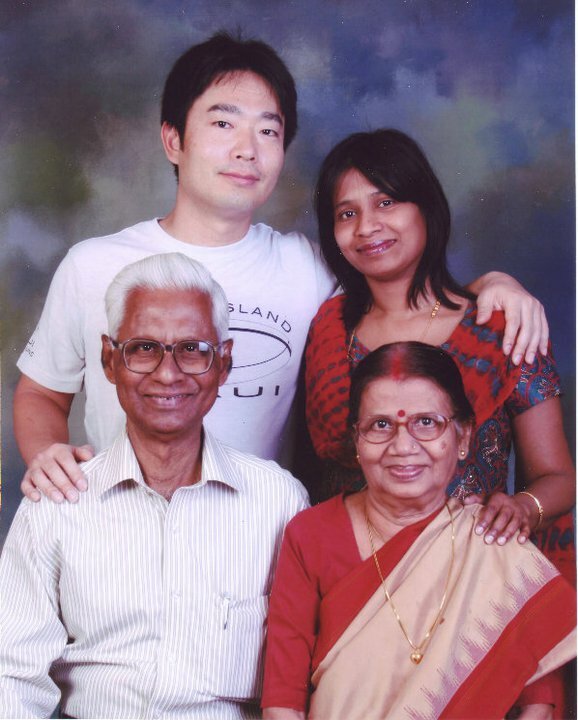 Do visit Akita if you get an opportunity.